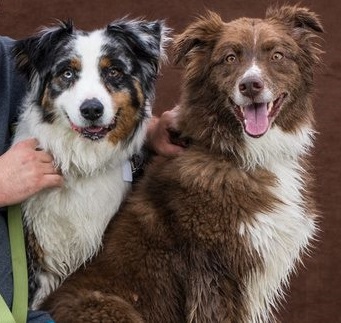 Ozzy is a 6 year old blue merle male and Sydney is a 4.5 year old red bi color female. They're just the best dogs. At the park, they seem like midgets due to the amount of Great Dane, Newfies and other large dogs there. This picture was taken from a local dog expo nearby me. They had a professional photographer there which is where this picture came from. Also had a bunch of booths set up selling various pet products. The highlight was the agility course that they had set up. It was up and back twice with each leg having some obstacles and the dogs chased a plastic bag that was on a wire throughout the course. Neither of them had done agility before so I wasn't sure how they were going to do. Ozzy was first up and completed the course in a very good time. They said it was the 2nd fastest of the day. Sydney is much faster than Ozzy so I figured she'd set the new record. Unfortunately when it was time for her to start, she just jumped over the fence to see her brother. The second try the same thing happened, so the person running it suggested they go together. Even though she's faster, Sydney was just trying to catch her brother on the course. If they ever have this set up again, I'll try to have them not go back to back so I can separate them enough to see how Sydney does, but that's the way she is, totally attached to Ozzy. Except if we're at the park and there's a ball involved. She could do that for hours most days. She'll just sit there and stare at the ball, and then look up at whoever's nearby expecting them to throw it. The best part is, they'll pick up the ball and throw it, and she'll just stand there. She's tricked just about everyone at the park. She's particular about which ball you throw and also doesn't look up, so if you throw it high and she doesn't see it land, she's not getting it. She also doesn't like Ozzy herding other dogs, so when he's chasing she usually cuts him off. It used to be head butts to the side, but now he realizes it's coming and pulls up. They are just so much fun to watch. If you get an adult Aussie my advice would be to get a female and take him with you to go meet her. It's best to do it on a neutral ground so that he doesn't feel as though you brought the other one home to replace him. If you bring in a puppy be prepared it will take him about a month to get used to having a small one around, there will be bouts of aggression, and since the puppy won't know the difference, be stern in your scolding and don't back off, the larger animal will let the smaller one know when enough is enough. He probably won't hurt her so just be aware. It took my Sam who is a red merle about 3 weeks to get used to the new pup and now he enjoys playing with her. Noelle is a Mini Blue Merle, now when they play Sam will Get Noelle started up then he'll run to the other side of the room and put his front part of his body slightly twisted and she will come and pounce on him and his tail will wag and he'll bark and show his teeth mouth wide open but shows no aggression towards her and when he tires of playing his voice will change and the pup will go lay down and behave. Enjoy they are a splendid breed. Aussies are SO entertaining to watch! Thanks for sharing. I am fairly new to Australian Sheppards having had our 2 year old rescue blue merle about 6 months. He is just amazing me on a daily basis! We have entertained the idea of getting him a little sister or adopting a bigger sister but am not sure how he would respond to having competition for our affections. He seems like the one dog type but I would love to see him with a sibling that he totally bonded with such as is the case with your Ozzy and Sidney! Now that would truly be twice the fun!